Cyrsti's Condo: Trans "Girl Chat"
I have made mention here in Cyrsti's Condo of my two dear transgender friends, one a trans man and the other a trans woman. The other night, I also made mention of the Equality Ohio meeting my trans girl friend invited me to attend. Afterwards, we were able to sit down and engage in some very rare T-girl chat. No matter how you cut it, our experiences are so unique, it's difficult to even find another transgender person geographically close to you-let alone be able to sit down and talk face to face. Even though my friend is much younger than me, in many ways we are at the same cross roads in our transition. An example is how we both agonize over actually pushing ahead with our gender marker changes. My problem is a combination of pure laziness and procrastination more than anything else. I'm notoriously bad about not living in the present, so if something isn't particularly bothering me (gender markers) then I can easily put them off in my mind. As we discussed (and I have written in the past) changing your gender marker with the DMV here in Ohio is not particularly tough and (as I understand it) neither is the social security set up. On the other hand here, birth certificates are impossible. Plus, my trans guy friend has done all he could including a legal name change, so he knows the process and I can ask him for specifics. I do know I have to go back to my therapist at the VA to get some sort of a letter too, so that is not much of a problem. 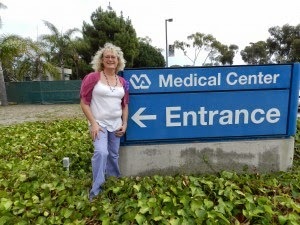 Other than that, I don't want to even get into how the VA works, except to thank trans vet Autumn Sandeen (shown above) for opening many doors I will need to go through to change my markers in the VA system which is a huge step towards NOT being called by your male name when you go in for an appointment. Other than the marker chat, we talked about her work and how she planned to handle any transition on the job. All three of us have gone different routes with jobs. I of course am retired but I could tell you without a shadow of a doubt my last employer would have made any transition on the job hell on me. My trans man has transitioned on the job already (with - as I understand it various stages of acceptance.) Finally, my trans woman friend has not transitioned past the point of being viewed (I imagine) as a very effeminate man. One of them works for a perceived diverse company and the other company-not so much. Bottom line is, she has a lot to consider with transitioning on the job including no real legal protection. By now you are probably thinking, did you two have any sort of girly girl chat? Yes we did. She asked me why I rarely wear skirts and what was I doing about facial hair. Truthfully, I am very much a contradiction in terms (again) in that I'm sort of a "Tom-Boy" trans woman and that's the way it is. (It sends the trans purists over the edge. Like I'm supposed to conform to their ideas?) As far as electrolysis goes, I have a couple problems called finances and aversion to pain. On the other hand, my friend is already baby smooth but seems to always be heading back for more treatments. Finally, before we parted ways-we did talk about the future on a bigger "what if" scale, as far as possible surgical procedures. My trans man is actually close to his "top surgery" and I wish him the best and all of a sudden, there is a glimmer of hope (with recent developments) I may be able to at least look into the two procedures I would really like to have-breast augmentation and FFS, facial feminization surgery. I will have to get back with you on what my trans friend thought about herself except she "really" wanted something done about her nose. So, all in all, it was a fun couple of hours with another person who has walked a mile in my shoes and vice versa. They are so difficult to find!! !